The views expressed in this blog are based entirely on personal tastes and opinions. They should not be construed as professional reviews in anyway. Any resemblance to actual reviews, living or deceased, is entirely coincidental. We signed up for the Far Card (formerly known as Feed At Raffles) because there was a pretty good promotion on. It makes the most sense with 2 diners - the second diner essentially dines for free. We figured one visit to Jaan would more than recoup the annual fee for the card. We visited Jaan on a Sunday evening, and had their 7-course Menu Prestige. They were still serving their Spring menus, so everything was quite bright, fresh and clean-tasting. We started with a host of canapes, including a smoked eel with konbu jelly and chef's interpretation of hummus. The eel definitely stood out, for its smoky and umami flavours. The amuse bouche was a sabayon with mushroom tea poured on top. The mushroom tea was light yet earthy, and went very well with the creamy sabayon. First course was a Spring Infusion, featuring a host of fresh spring vegetables. While I'm not a fan of vegetables in fine dining, I must say these were excellent. They were fresh and sweet, and really did capture spring on a plate. The next course was langoustine with ratte potatoes and caviar. The langoustine was just barely cooked, but the best thing on the plate was actually the potato. Next up was one of chef's signature dishes - the Rosemary Smoked Organic Egg, featuring an egg that was cooked sous vide for 55 minutes. It arrived amidst plenty of drama, with dry ice swirling around springs of rosemary. 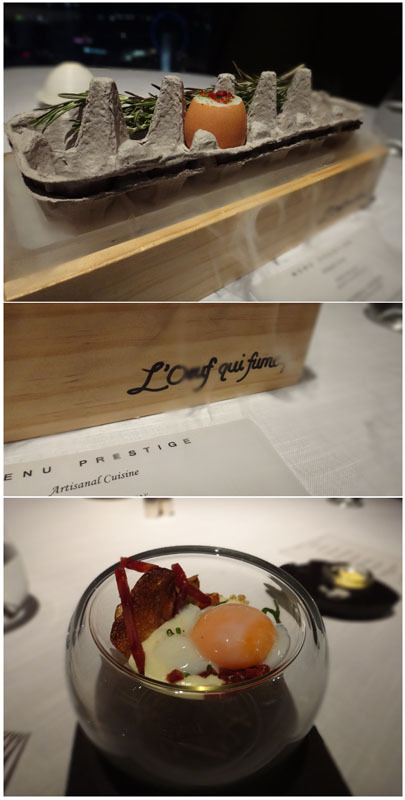 It even had a bespoke wooden container with the words "L'oeuf qui fume" (smoking egg). I guess the dish is a specialty for a reason. Ignoring the (in my opinion, somewhat unnecessary) drama and production, the egg is perfectly cooked, with the runny yolk pairing perfectly with the chorizo iberico and smoked ratte potatoes. The foie gras course was a bit of a letdown. Little cubes of foie were served with seared strawberries, which when eaten together overpowered the foie. They were better deconstructed and eaten separately. The fish course was a Roasted Atlantic Brill, with white and green asparagus, crayfish and garlic cream. Flavours were again very clean and very subtle, although there was a particularly flavorful parsley foam that added a flavour punch. Another of chef's specialties is the Hay Roasted Bresse Pigeon. The leg was served confit style, and breast was roasted to a perfect rare. I don't know they managed to achieve such a perfect even rareness, but it was superb. I loved the gamey flavour of the pigeon, and the barley risotto and mushrooms were a great accompaniment. After a palate cleansing sorbet, I had a lemon curd, verbena and elderflower dessert, while A had the Choconuts, which features 4 different types of chocolate. I preferred mine, as it echoed the Spring lightness of the rest of the meal. Overall, food was definitely good. I liked the subtlety but I think A was hoping for or expecting bigger hits of flavour. Service was good, but somehow the whole dining experience seemed a bit cold. Everything was very professional but it lacked a warmth and personableness that I guess we favour. We'll probably go back once, maybe twice more, while I still hold the Far Card, but we certainly won't pay full price. The service and food are great, but the winner here is the view. So it makes a great place to treat guests if you have an big entertainment budget or want to celebrate a special occasion. Other than that, I don't think it's worth paying full price. Any idea when is the summer or seasonal menu changed? Just with the far card- do you have to order from a separate menu with restaurants participating or is it the usual ala carte menu? 1) Sorry, no idea when it switches to the summer menu. 2) For the Far Card, it depends on the restaurant. Some don't allow one-for-one at lunch (e.g. Jaan), some have blackout dates like Valentines' Day. At Jaan, for dinner we picked from the usual tasting menus; no separate menu just for Far Card diners. I am waiting to go to Jaan!, I think they restrict the number of FAR users per day. We couldn't get a reservation for my birthday so we went to Equinox instead. Have you guys tried it? I think it has a fantastic view but the food is ...decent but just not quite trying hard enough, so I think it's too pricey if you don't have the FAR card.